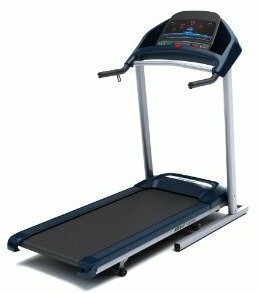 The Merit 715T Plus treadmill is actually one of the better power treadmills at the entry-level price of $350. That isn’t to say it is worth even paying that much, but it does beat anything that Weslo makes. On the Merit 715T Plus treadmill console are three LED windows that track your resistance level, speed, time, and distance. The four fitness programs include weight loss, rolling hills, intervals, and manual. 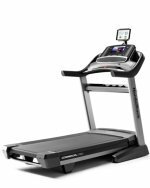 The Merit 715T Plus treadmill has a 1.25 continuous-duty hp motor (2 thp), 1.65" (42mm) rollers, Aerosoft cushioning system, a speed range of 1.0 to 10 mph in 0.1 mph increments. It has a folding frame, a walking area of 18'' x 47'', and a manual 3-position incline range of 0 to 5 degrees. Reviews on Merit treadmills are very mixed. While some users have reported no problems with using the 715T, others report they never had a working machine right out of the box. (That problem seems to involve a broken wire connected to the motor – the customer service people seem to know how to fix this by heart.) There are also an unusual number of users who have mentioned that when pieces are missing or broken before assembly, the parts they request are usually on backorder. Despite the attractive layout, the plastic on the console is flimsy, and all parts are only covered for 90 days. Also, the 1-year motor warranty is very weak which indicates Merit doesn’t think much of the motor either. First of all, the terms “$349” and “treadmill” do not go together. You take a big risk by buying a machine this cheap, as too many corners have to be cut to get the price down. 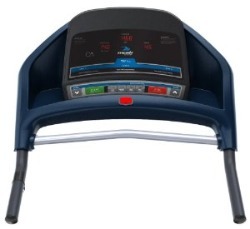 The Merit 715T Plus treadmill is an upgrade on the old 715T which also received many mixed reviews. To avoid any headaches, you really should save your money and wait until you can afford something better. On the plus side, this is only a 109-lb machine so it may be easier to repackage and return than heavier models.